January 27, 2015, 4:08 PM · A childhood rich in language and music education wires a person's brain better to perceive the meaning in sounds -- and it's a clarity that lasts a lifetime. But when deprived of meaningful sound in childhood, a person perceives static around sounds and is less able to render meaning from them. This was one of the fascinating points brought up by professor and researcher Nina Kraus, who is Principal Investigator at Northwestern University's Auditory Neuroscience Laboratory in Evanston, Ill. She was speaking a forum called "Music and Your Brain – the Science of Change," at the KPCC Crawford Family Forum, a public radio event in Pasadena, Calif. (You can watch the whole program here.) 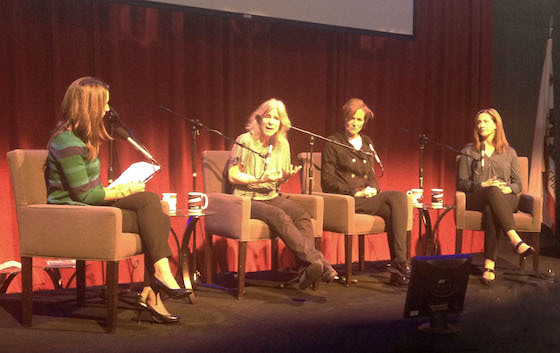 She was joined by Suzanne Ginden, founder of the Boyle Heights Community Youth Orchestra in Los Angeles; Kristen Madsen, Senior Vice President of the GRAMMY Foundation and Musicares; and moderator Mary Plummer, Arts Education Reporter for KPCC. A person's childhood exposure to meaningful sound appears literally to wire his or her nerves for sound perception, Kraus said. "With unprecedented precision, we can measure how the neural system responds to sound," Kraus said. Using electrodes, researchers have measured neural responses to language among two groups of children: those whose mothers had a high level of education, and those whose mothers had less education. "Children of moms with more education heard more words and more complex language," Kraus said. "Kids who had moms with less education had more neural noise -- the neural response to noise was less precise." Kraus played two recordings, representing how each of those two groups heard language: in one recording, the language came through clearly; in the other, the language was embedded in static and more difficult to discern. If every time you hear a sound, you process it in a different way, then it's hard to get any consistent meaning from that sound and the result is a fuzziness in perception. That "fuzz" has profound implications for a child's future ability to learn from a teacher in a classroom setting and even to learn to read. How can a child who starts out with that kind of a disadvantage turn things around? One possibility might be music education. "It turns out that musical experience -- the activity of making music -- changes how the brain processes sound," Kraus said. And those ingredients in sound processing track with language and reading development. "The learning of music might translate to becoming a better communicator," she said. But to have any effect, one needs to actively play or sing music, and over an extended period of time. In studying children in music programs, "we didn't see any measurable changes after one year of music-making," she said, but after two years of music-making, they were able to measure fundamental biological changes in auditory learning. Research found that children who can match drumbeats have better language potential than those who could not. "There's a lot of rhythm in language," Kraus said. "The simple ability to track to a beat, tracks with language development." It is possible to see, measuring the brainwaves of a two-year-old child, if that child can track the rhythm of sound, and if not, that child may be at risk for language problems in the future. Learning rhythms doesn't require a lot of training, but the skill can get stronger with practice and instruction. Given that music education is scientifically proven to boost a child's brain development in myriad ways; it would make sense for communities to devote enormous resources to ensuring the success of music programs, in all schools. Sadly, it isn't so. Music education programs, at least in the United States, tend to be piecemeal, poorly funded, rarely supported for more than a few seasons, and always positioned directly under the budget-cut ax. But music teachers keep trying. 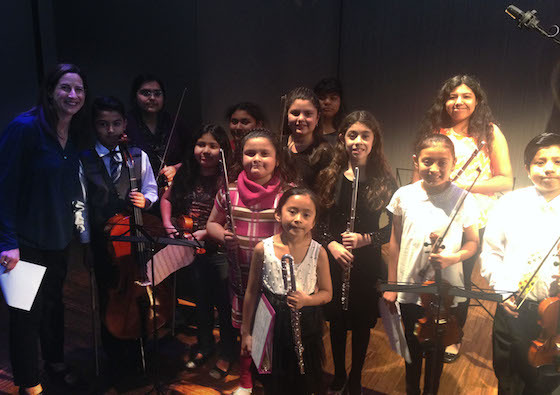 Music teacher Suzanne Gindin described the program that she founded two and a half years ago in one of Los Angeles' poorest neighborhoods: the Boyle Heights Community Youth Orchestra. Based on an El Sistema model, the program provides music instruction and instrument loans, free of charge, to children aged six to 14. About 65 kids signed up for the program in the beginning; that number later dropped to about 25. After the initial enthusiasm of signing up, kids and parents discovered that "it's hard to play an instrument," Ginden said. The people who stuck with it tended to have parental support, or they lived close by. "Those who are sticking with it, see real results," she said. Not only are those children getting proficient on their instruments, but their parents also report improvements in math grades, reading skills and sociability. Kristen Madsen, of the GRAMMY Foundation, said that oftentimes for local music programs, "The threshold of making a difference financially is small." Combine a reasonable-sized grant with a dedicated teacher, and a lot can happen. An overwhelming majority of Americans believe that music should be a regular part of educational curriculum, "and yet, it gets marginalize," Madsen said. Because music and the arts have been marginalized in education for so long, "a whole generation of teachers is not versed in teaching the arts," moderator Mary Plummer said. Imagine, if a music curriculum (or any curriculum, for that matter) could be developed, based on the groundbreaking information that scientists like Kraus know about brain development, instead of based on politics and marketing. Imagine if the teachers and the programs at a school weren't pitted against each other in a zero-sum fight for time and resources, but viewed as combined disciplines. "What if our school curriculum was based on her science?" Ginden said, gesturing to Kraus. One could create symbiotic lesson plans that matched a child's language and math development to the child's musical development. For example, a music teacher could be teaching kids to track a beat in preparation for the reading teacher to introduce various concepts in phonics. One audience member was a teacher at a charter school with no music education. Her only option so far had been to have the kids sing to computers, which wasn't exactly active music-making. She asked the panel how she, a non-musician, could add some music to her classroom. Ginden, who has had experience teaching music curriculum to non-music teachers, suggested starting a recorder program, which is relatively inexpensive and allows kids to learn to play an instrument and possibly even do some music reading. Also, "Sing songs about everything you do," like from putting away papers, etc. She also pointed her to LessonPlans.com and also the Little Kids Rock program. In conclusion, we heard a lovely concert from 12 of Ginden's students, who had waited patiently and silently through the talk, then played with with steady confidence and competence, sang a song in Spanish, and answered questions from the moderator in English. From my vantage, both their musical and language skills were well on their way. January 28, 2015 at 03:06 AM · Great ideas . . . but please, what is the instrument held by the little girl in front? a kind of bass flute? January 28, 2015 at 05:22 AM · It would appear so! Very nice that kids who have only played for two years were able to play together, in full harmony, with all these instruments. January 28, 2015 at 09:50 AM · In my country, music education in schools is all but non-existent these days. So getting a music education is considered a private endeavour, and guess which kids luck out ... After reading this, I shall now have to insist that my grandson is given a music education beyond my singing and playing baby instruments with him. I was very touched by the story of the young orchestra. Thank you, Laurie! January 28, 2015 at 02:23 PM · I find this research fascinating, but I feel that in my case it didn't work particularly well. Even though I've had formal musical training since age 7, I struggle a lot with finding meaning in sounds. My reading and writing fluency in foreign languages (and even my native language) is much better than my fluency with speaking and hearing. I don't learn music well by ear, and in general I'm mostly a visual and kinesthetic learner. I get very little out of, say, just listening to a lecture if there aren't visual aids and I don't take notes. The description of "static" in the auditory world rings true to me. I find the open office environment to be a nightmare for being able to get anything done. I need quiet, or some orderly music on headphones, in order to concentrate. But, on the positive side, maybe things would have been even worse if I didn't have musical training. Through musical training I've become more self-aware about these types of issues, and even how they can be overcome with practice. So proud of you and your work in this great organization! Just fantastic! Maybe I'll see you in LA sometime if I come down that way to play again. Keep up the good work! I think the instrument in the front row is just a regular flute with a head joint that allows children to play easier because with the bend it makes the instrument shorter for the student to reach all the keys whir maintaining the over all length.